I know tensioners have been discussed at length. I have a 2000 XJ8, 100,000 miles. I pulled the covers and it needs tensioners. I'm tempted to just zip tie in the uppers, rather than removing the timing cover, and doing eveything. I know no one can predict what could happen if I don't replace everything, but am I right that it's the uppers that destroy an engine, and the lowers and guides do not? I guess I'm looking for reassurance to go cheap/easy. With that mileage, I bet your lower guides are cracked, and probably pieces are ripped off and laying in the sump or partially blocking the oil intake. I have seen several by now, they are all the same. Yes, you are right in a certain way, the uppers are more critical in case they break down, but lowers can spill havoc too. I should not go cheap, certainly not with that mileage. I replaced the uppers only on several engines and they're all doing well with up to 40K mi and several years. 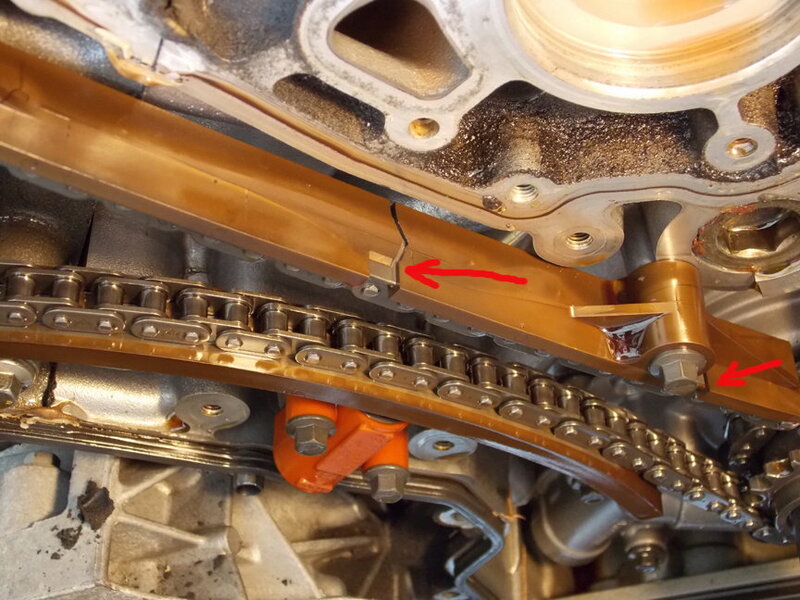 But if the chain guide plastic starts disintegrating the oil pickup screen could be blocked, potentially destroying the engine, while if a lower tensioner fails the pieces could jam the chain. It's a very rare event, but if you intend to keep the car for many years a total replacement, including chains, would be a wise decision. 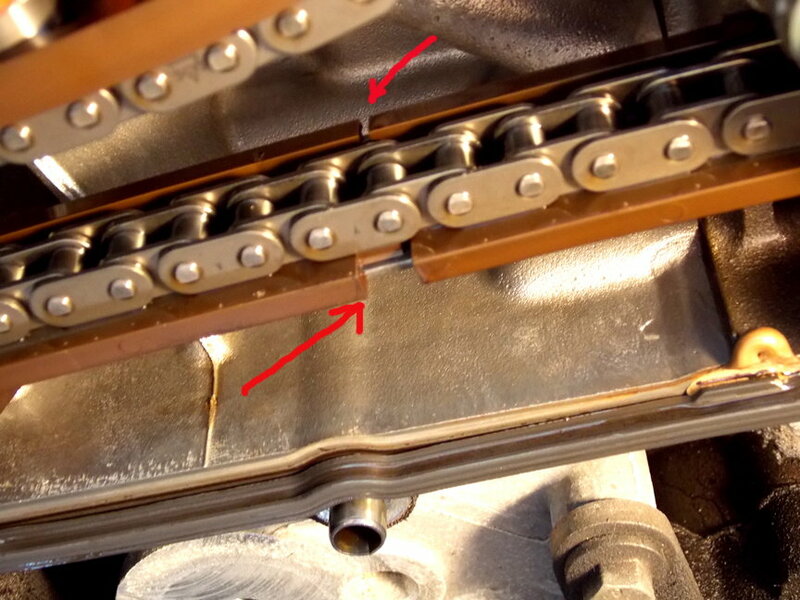 It is true that it is the upper tensioners that suffer from earlier deterioration than the lowers, but the lower tension guides crack and begin to break up at a similar time/mileage. This doesn't cause the tooth slippage of the upper chains, but the broken parts of the slipper guides are not desirable in the engine internals, and the lower tensioners are plastic, and I believe will eventually suffer from the same fate as the uppers. To do the complete tensioner job is a bit of a PITA, but for longevity and peace of mind I would recommend it over just replacing the upper tensioners, especially if you intend to keep the car for several more years. Here are pics of my lower tensioner guides at 70,000 miles/17 years old. +4 to the previous....replace all and peace of mind will prevail. 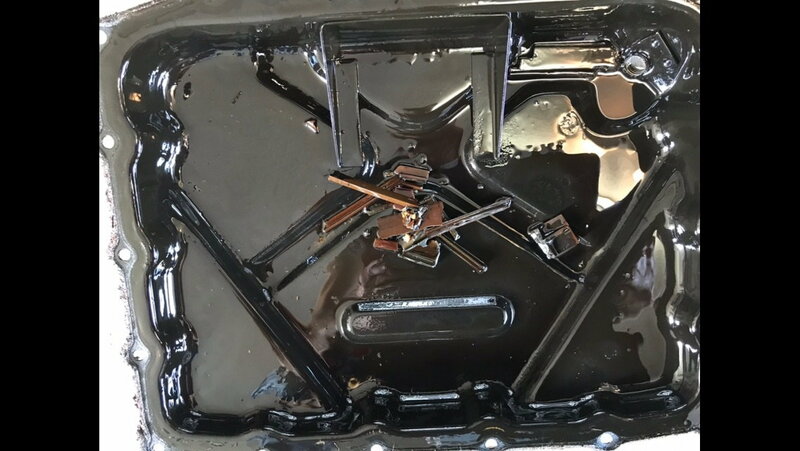 Detritus in oil pan. Broken bits from the lower timing chain guides and upper tensioners. I removed the pickup tube and washed all the broken bits out with hot water and Dawn dish soap in the sink . Plus the guide rail broke off completely rubbing and could have jammed the crank gears. False economy to replace just the secondary timing chain tensioners. 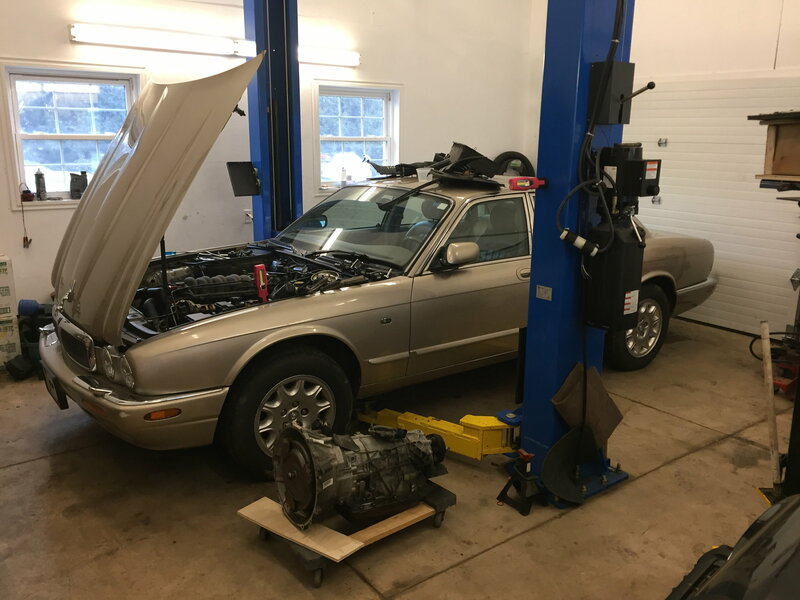 Use the correct tools, follow the procedures outlined in the Workshop Manual and replace the primary and secondary timing chains, guides and tensioners. At 75k miles (and 18 years), my primary guides/tensioners had many cracks, luckily no fallen off pieces yet. 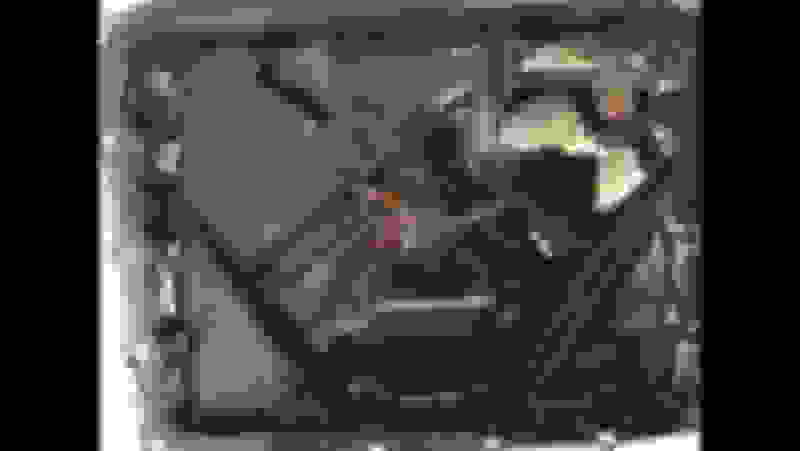 Last edited by M. Stojanovic; 02-04-2019 at 08:06 PM. Complete tensioner, chains, gaskets etc. If it hasn't already been done, it is advised to replace the plastic thermostat housing with a metal updated version. Replace the harmonic balancer bolt. Wow! Thank you for all your replies! What a great forum! I knew I wouldn't get much support for cheaping out with a quick fix on the tensioners. I guess I was tired after just swapping out the transmission- a big job - and was hoping for an easier next job on the car. The exhaust is the worst part! I've done the full tensioner job on my VDPSC, so I should just get at it. My local Jag tech will lone me the tools I don't have. Carnival; those are good prices on the kits, I'll try them. I've just retired and enjoying my new shop; warm and dry. Oh wow.....an auto lift! Talk about being spoiled! Yep, the jealousy factor just ensued...my next place will be a 3 car and a lift with one being a drive through. Just out of curiosity, does anyone know if jaguar ever upgraded the tensioner guides in the later models 2002 or 2003, like they did with the secondary tensioners? I'm getting ready to change the timing chains and tensioners. I've already got my loose leaf binder made up with pages printed from the manual with all the procedures, parts, and tools listed that I'll need. Now I'm sourcing the parts and tools, and I just purchased all the parts in one box. I love that idea, thanks for the link. Does anyone have such a kit for the tools, or what is the best source for those? Search the forum here, there are a few in-depth threads w/ tool info. etc. Last edited by King Charles; 02-14-2019 at 12:55 PM. Yep, plastic uppers are the big risk. I'm getting ready to change the timing chains and tensioners. Does anyone have such a kit for the tools, or what is the best source for those? Quick Reply: Replace just upper tensioners?